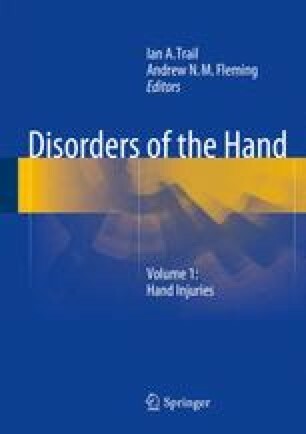 In this chapter we address injuries to the tips of the fingers and the disorders of the distal interphalangeal joint. It is important to appreciate that trauma to this area produces a variety of injury patterns, not only to the distal phalanx itself, but also to the other surrounding non-bony structures (Fig. 7.1). Injury to the tip of the finger is common and accounts for approximately half of all hand injuries  and is usually the result of a sporting, occupational or domestic accident. These injuries are important to recognise and treat appropriately to maintain hand function and prevent permanent disability.